There are three milestones this year for the Salt Lake City Public Library system. The City Library main branch marks its 15th year in its award-winning building, the system celebrates its 120th anniversary and the Chapman branch in the Poplar Grove neighborhood on the city’s west side, one of the last Carnegie libraries in Utah, is welcoming the community in monthly events to highlight its 100th year of service. 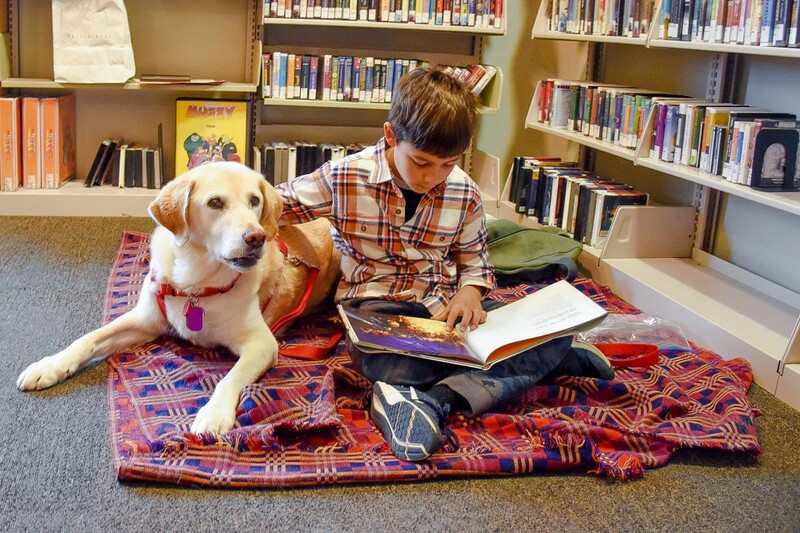 But, the more significant overarching narrative in 2018 is the collective effort of the library’s staff that has revitalized the connections and engagements with the Salt Lake City community in many ingenious ways. 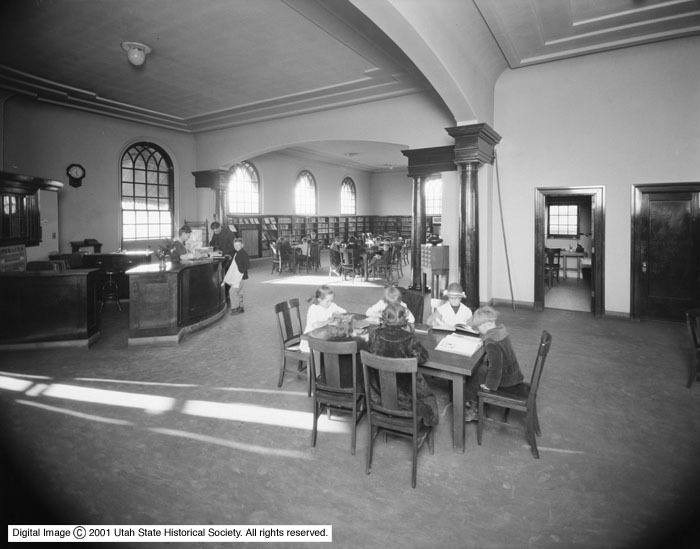 The historical photos of the Chapman Branch are from the Utah State History Digital Collections and the Utah State Historical Society. Indeed, as Peter Bromberg, executive director, said in a 2016 interview with The Utah Review, the city library is the perfect candidate for the ‘great good space’ of community and culture. Within a period of six weeks this winter, the City Library was one of the venues for two major film festivals. During the Sundance Film Festival in January, the library’s auditorium was packed regularly for screenings that included some of the event’s most visible films including The Tale, directed by Jennifer Fox, and Science Fair, a documentary in the Sundance Kids program directed by Cristina Costantini and Darren Foster that won Sundance’s inaugural Festival Favorite Award. 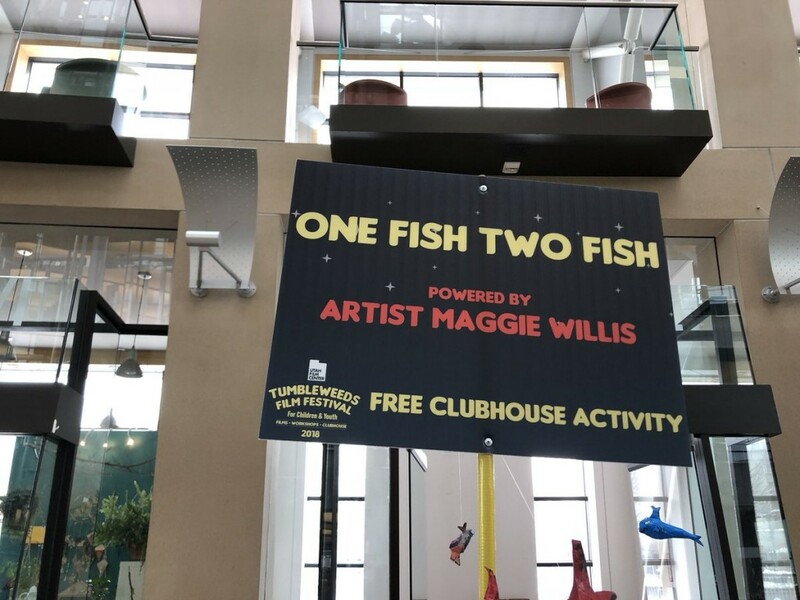 Earlier this month, the library was one of the three downtown Salt Lake City venues for the 7th Tumbleweeds Film Festival for Children and Youth, curated by the Utah Film Center. 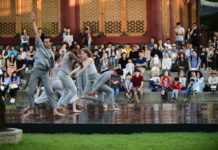 It was the first test of a new initiative that Bromberg believes will unite major institutions on the Library Square, including its neighbor, The Leonardo museum, in events regularly throughout the year. The library’s visibility is at its highest profile in at least a decade. 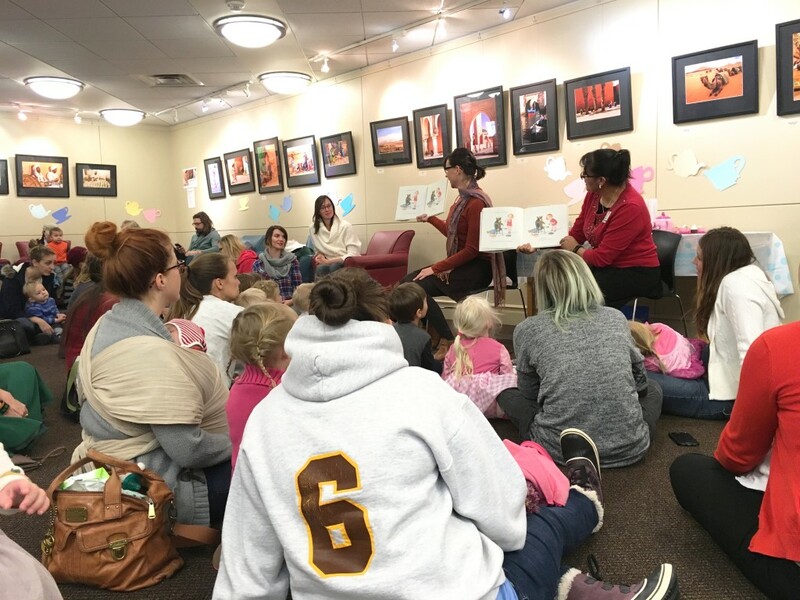 Just recently, some of the largest crowds for events have been recorded, including a party honoring the centennial anniversary of Dr. Seuss, celebrations for the Chinese New Year and the single biggest one-day totals for the used book sales coordinated by the Friends of the Salt Lake City Public Library. Innovative connections are being made in many sectors. HUM (Hear Utah Music) will be the new digital catalog for the library’s collection of albums and EPs created by Utah musicians. Scores of musical works have been submitted to a professional jury organized by the library who will decide which content will be included in HUM. For their efforts, musicians will be compensated with revenue from licensing fees. 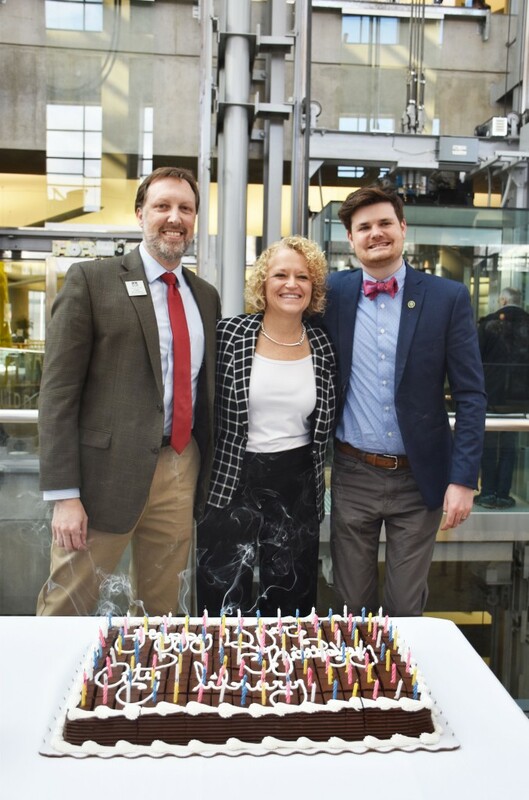 Peter Bromberg, executive director, Salt Lake City Public Library; Jackie Biskupski, Salt Lake City mayor; Chris Wharton, Salt Lake City Council member, District 3. The library’s after-school meal program, which is available on weekdays at the main, Glendale and Marmalade branches, has expanded into the Kids’ Café. Kids enjoy healthful snacks (sandwiches, applesauce, sunflower seeds, raisin, cheese sticks and even hummus) and then play games, log on to a library computer, or play on the piano. The Glendale branch, in one of the city’s largest neighborhoods on the west side, draws up to 80 kids on weekdays. 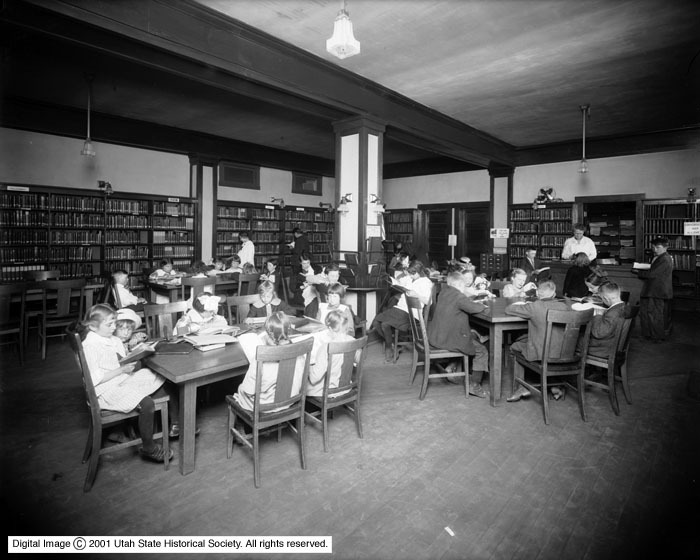 In fact, the program’s popularity at Glendale, coordinated with Volunteers of America, Utahns Against Hunger and the Utah Food Bank, led to library officials expanding it to the main and Marmalade branches. As many visitors have noticed on their way to the Rooftop Garden, the library maintains a beehive and offers the honey that is produced. Last year, the landscaping surrounding the main level of the downtown branch was renovated as a garden area now known as The Plot, which will be the library’s community garden. Salt Lake City residents who live in downtown or in areas immediately adjacent to the city’s central district will have the opportunity to claim a spot in one of 12 garden boxes that will be available for public use. That fullness is evident in Chapman’s centennial anniversary, which brings the Poplar Grove community directly into the yearlong celebration, according to Mary Anne Heider, branch manager. Each month, a theme dictates the events, highlighting one of the decades in Chapman’s existence. In January, there was a Mad Hatter’s tea party, while February brought a Valentine’s Day soirée with chocolate organized with the 1920s in mind and F. Scott Fitzgerald’s Great Gatsby. This month marks the 1980s with a movie marathon and karaoke night. 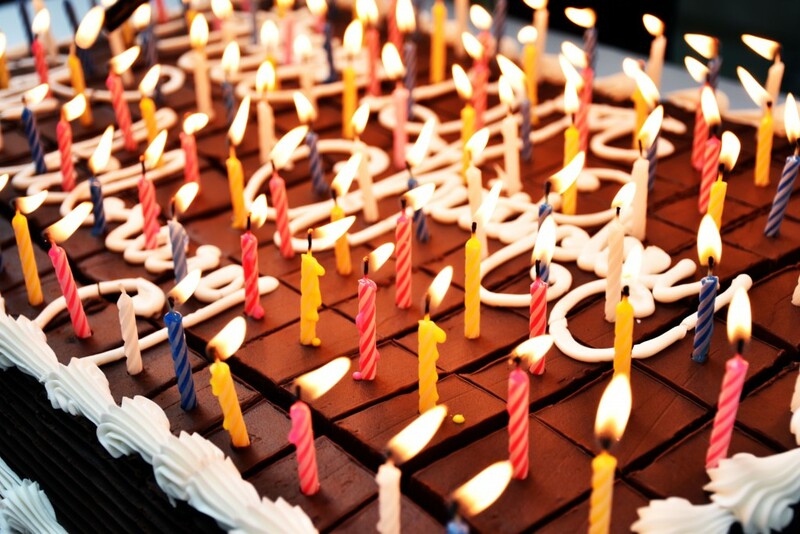 The branch’s centerpiece celebration will occur June 2 with music, reenactments of historical periods, vintage cars, kids’ events and an outdoor Big Band dance highlighting the 1940s and Hollywood canteen scenes. 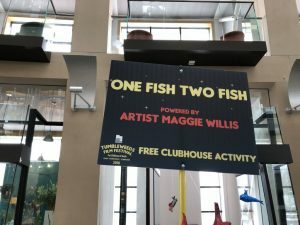 In honor of Dr. Seuss, children attending Utah Film Center’s Tumbleweeds Film Festival events at City Library created crafts based on One Fish, Two Fish, Red Fish, Blue Fish, one of Dr. Seuss’ classics. 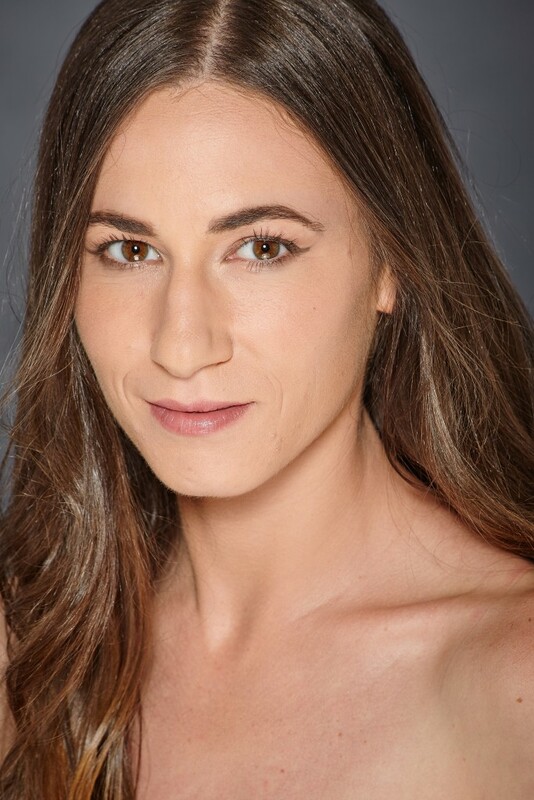 Resilience is the theme of Chapman’s story, located in a neighborhood bounded on the west side by I-15, extending to city limits and south of North Temple to 950 South. The branch was built in 1918, funded in part by a $25,000 gift from the Carnegie Foundation. 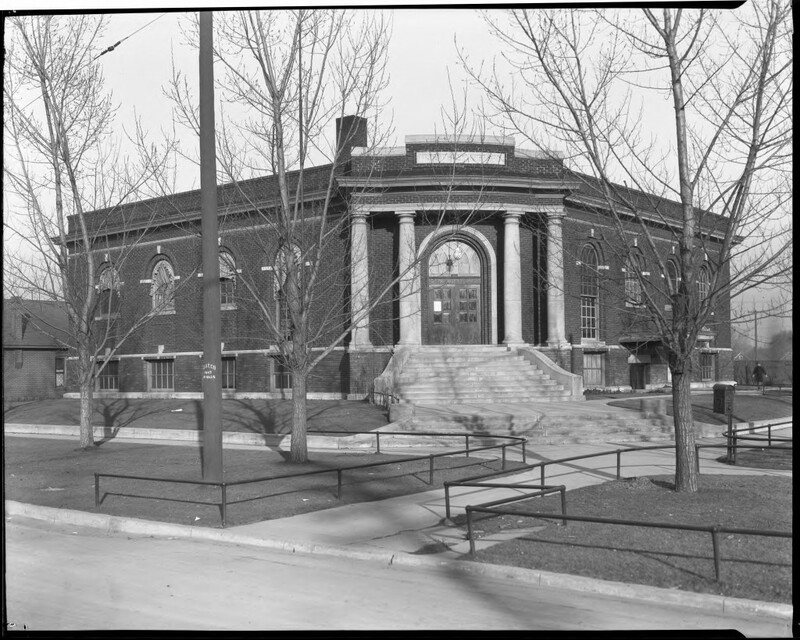 It was one of nearly 1,700 Carnegie libraries built in the U.S., including 23 in Utah. Chapman is one of the last buildings in Utah to function in its original purpose. The branch was named for Annie Chapman, the first director of the city’s library system when it was established in 1897. The building, constructed by the Ashton Improvement Company, added some touches of the Renaissance Revival architectural style to the Classical Revival style that was a hallmark of many Carnegie Libraries. The Chapman branch, encompassing 8,900 square feet, is an L-shaped brick building with round arch windows and a less pronounced entablature than many other Carnegie libraries. The chief architect was Don Carlos Young, Jr., who designed the University of Utah central campus layout. Tea Party Storytime at Sprague Branch, 2016. Even though the building was listed on the National Register of Historic Places in 1980, the Chapman branch endured events, natural and human-made, that threatened its continued existence. In January 1993, after a heavy snowfall, the east wing collapsed and workers were able to save 90 percent of the collection, which included children’s books, fiction and foreign language volumes. The branch returned to limited service within three days, thanks to a bookmobile provided by the Utah State Library and the staff moved into a trailer in a parking lot at the Smith’s Marketplace store near 900 South and 900 West. By the end of the year, the branch was rededicated after its restoration which sustained the historic integrity of its original construction. In 2010, the central library administration briefly contemplated closing the branch, an option that residents saw as controversial and unthinkable, as plans were being made to build a larger branch for the adjacent Glendale neighborhood. While the historic designation prevents any renovations from changing the architectural integrity of the exterior, interior redesigns have translated into better, more relevant services to fit the needs of Poplar Grove residents. 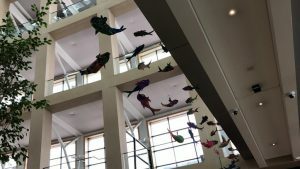 In 2002, the auditorium was converted to a bright, cheerful space for children that includes a slide, aquarium, natural murals, and cloud images shaped like animals. For its 100th birthday, the branch’s interior space is being opened up a bit more to accommodate computer workstations and other events for groups to meet. Debbie Ehrman, the library system’s deputy director, says the initial phase of improvements included new carpets and furniture as well and a second phase will encompass items to keep the century-old structure in excellent shape. This will include repainting woodwork, a deep cleaning of the building, updating fixtures, landscaping and freshening up of the children’s space. With the improvements, library staff believe that it can give the system’s oldest branch the comfortable openness that has become a standard feature in other branches. Ehrman also emphasizes that the objective is to brand a consistent appearance without making it seem like a “cookie-cutter approach,” given the unique blend of historic and newer buildings that comprise the system. As Chapman marks its centennial, Marmalade on the northwest side of downtown is just completing its second year. In Sugar House, the Sprague branch, the second oldest of the eight in the city’s library system, endured a natural disaster last summer similar in scope to the storm that took Chapman offline. A flash flood made the building, a classic English Tudor with high gables that opened in 1928, uninhabitable. There has been limited service but the building will be reopened temporarily this spring for patrons (including the children’s space and public restrooms) before being closed next fall for a full-scale interior renovation. Ehrman says the historic exterior will be preserved, the surrounding garden space will be redesigned to accommodate new activities and the branch will be reopened and rededicated next year. The downtown City Library branch also has been extensively refreshed with new carpeting and new landscaping. One of the most significant enhancements is now available (and will have its grand opening celebration March 10). The technology center was renovated to incorporate a new Creative Lab with extensive and diverse studio resources. The lab’s space and sound booth is used monthly to host ‘Open Mic’ events, coordinated by Lara Jones of KRCL-FM’s RadioActive program. The 3-D printer has inspired numerous creative examples, including animal skulls and a staff member printed components of a 3-D printer. The large format printer has been used by patrons, including producing large posters for a wedding. The lab includes sewing machines and sergers, which allow individuals working on textile projects to create locked stitches and includes a blade is situated right in front of the needle so that the fabric can be cut on the machine before it is sewn. There is a station where patrons can digitize home movies from any format, along with a film editing station and a green screen. There is a music station equipped with a MIDI keyboard and a bundle of music software that is updated continuously to the latest available versions. The Glendale and Marmalade branches also have Creative Lab spaces which offer workshops and are available for individual use throughout the week. Children’s Librarian Scott Bahlmann offering hummus to Kids’ Cafe participants. Community groups such as the International Rescue Community have used the lab to help newcomers become more confident in using computers and digital technologies. In tandem, the library has a Tech League volunteer program, supported in part by Cotopaxi and the Applied Technology Foundation. 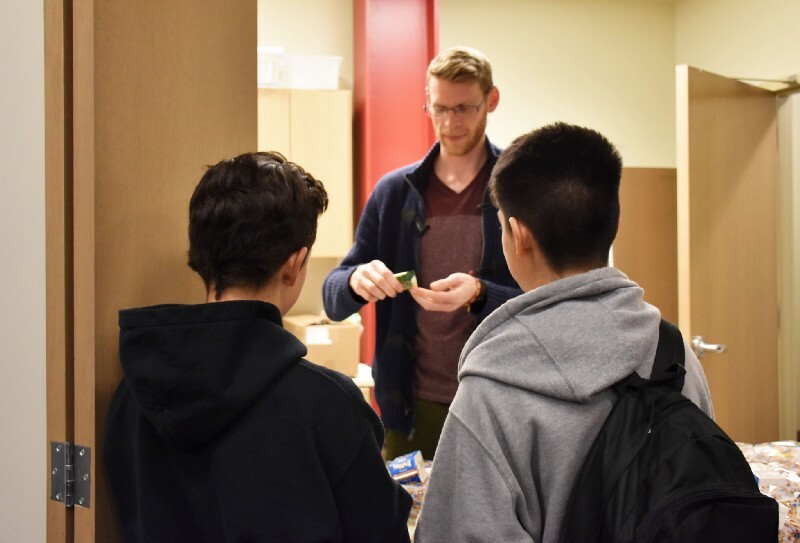 These volunteers act as mentors who work with patrons in various settings that extend to services coordinated with the Asian Association of Utah’s Refugee and Immigrant Center, Horizonte Instruction and Training Center and Volunteers of America. The program has leaped to a quick start: 21 active volunteers currently and as many as 60 have participated since the program was established last year. 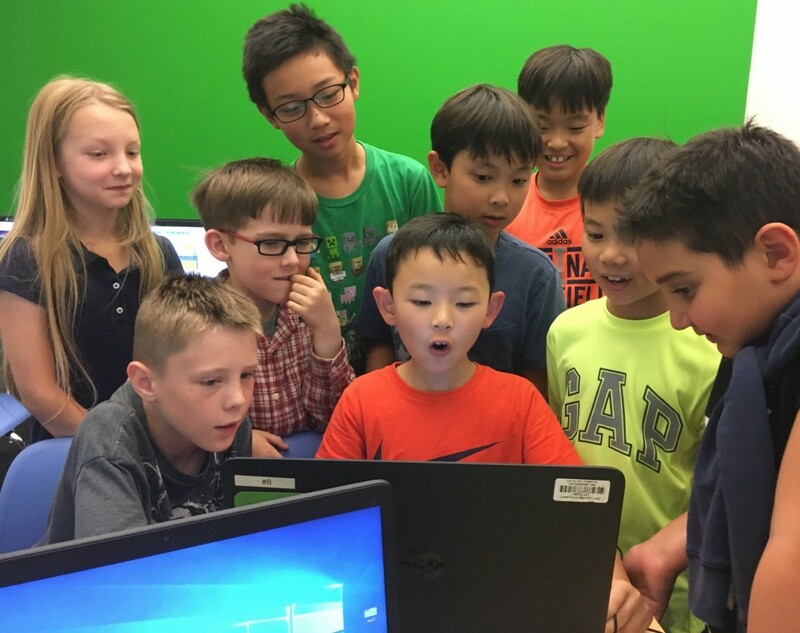 The library’s code clubs for youth also have surged to new levels of enthusiasm. While many individuals tout Utah as a potential thriving corridor for technological innovation and employment, coding education opportunities are limited for students, especially those in minorities who have been underrepresented in the industry. Only seven percent of Utah high schools offer the Advanced Placement (AP) computer science course and of the 129 students who took the exam last year, barely more than a dozen were female and less than 10 percent were minorities. In the first 11 months of the coding clubs, some 240 students, some as young as 8 years old and representing parity especially in gender representation, have learned how to code and build video games, websites and apps. The students have taken the experience to form their own online communities. Bromberg summarizes all of these efforts as fulfilling the objective of universal access that was integral to Chapman’s vision when the system was established near the end of the 19th century. Reliable broadband access at high speed is just one element. As of last summer, the library system no longer charges fines for materials returned after their due date. Fines have been decreasing steadily every year, mainly because of the increased circulation of digital materials which do not accrue fines. The revenue from fines only accounted for a tiny fraction of the system’s $22.4 million budget so the decision to halt the collection of fines resonated as a strong goodwill gesture that was welcomed uniformly throughout the community. Volunteers of America’s (VOA) library engagement team is fully integrated to help members of the homeless community. Yoga, meditation and exercise activities bring a diverse cross-section of the community at no cost or obligation. A super-sized chess set and large-scale version of the classic Connect Four game (created by Hasbro) in common spaces at the main branch delight children and adults. On the second Monday of every month, the Marmalade Branch, with support by KRCL-FM’s RadioActive program, presents Ballot Talk on upcoming ballot initiatives that will be decided by Utah voters. 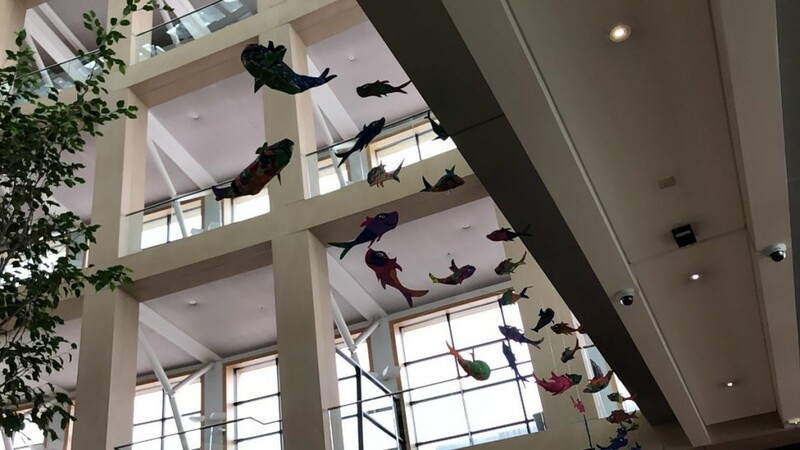 In ensuring there are no barriers, the library also has been creative in its efforts to make the environment as safe and welcoming for all individuals. The library staff worked with VOA to establish a restroom monitoring service that assures the privacy, health and safety of all individuals, regardless of status or circumstances. Some library staff members have been trained and certified in crisis prevention as well as techniques to deescalate potentially dangerous situations before there is a need to summon law enforcement. Certified staffers, in turn, train their colleagues and the cycle repeats continuously. Indeed, it was the calm, quick thinking of librarians and security personnel that proved critical last fall when the suspect in a high-profile murder at The University of Utah was spotted at the main branch and taken into custody without incident.